Brazil’s right-wing presidential canidate Jair Bolsonaro underwent emergency surgery on Thursday after he was attacked with a knife while campaigning in the countryside, officials said. 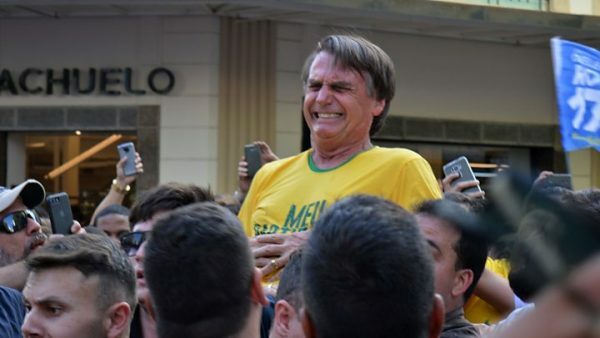 Brazil’s right-wing presidential frontrunner Jair Bolsonaro underwent emergency surgery on Thursday after he was attacked with a knife while campaigning in the countryside, officials said. In a press conference after the surgery, doctors said the lawmaker had “three serious bowel perforations” that caused internal bleeding, adding that they had performed a colostomy and he was now stable. Sometimes described as Brazil‘s Donald Trump, Bolsonaro has a huge social media following of 8.5 million people. The only Brazilian politician currently more popular is the leftist ex-president Lula — who is in prison for corruption and has been banned from competing in October’s election.